It's been a while since I've made pizza so I decided to go for it over the weekend. I used this trusty recipe that has never failed me. I usually mix it up the day before I plan to make the pizza so I can give it a slow rise over night in the refrigerator to develop the flavor but it was a spur-of-the-moment decision made in the morning. So I mixed up the dough right away and put it in the refrigerator to do its thing during the day. My original intention was to make my usual red sauce pizza, but I had bought quite a bit of broccoli a few days earlier that needed to be used and I was in the mood for a more vegetable-focused pie and I'm not a big fan of broccoli and tomato sauce. There's nothing wrong with it, I suppose, but when I think broccoli I think white sauce. The only problem with that is that I don't use much regular milk these days so I couldn't make a traditional bechamel sauce. But I do seem to always have buttermilk on hand, so I wondered if that would work. And it did work. The buttermilk gave the sauce a lovely little tang that married well with the broccoli and red onion. I will definitely do this again. I was feeling a bit lazy so I decided to make one big pizza instead of two smaller ones. I sprinkled some corn flour over my all-purpose half-sheet baking pan and spread the dough evenly over it. Because the broccoli is on the heavy side, I baked the crust for five minutes before spreading the sauce over it. 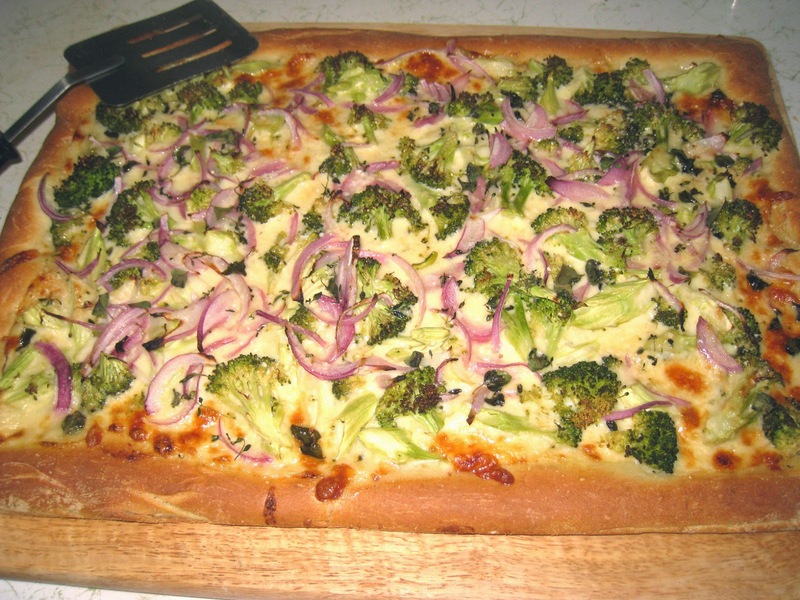 I followed the sauce with grated mozzarella cheese, then spread the broccoli and red onion over that. I seasoned it with salt and pepper, then topped it with grated parmesan cheese and sprinkled it with fresh oregano and thyme. Then I baked it for another 20 minutes or so. It was quite good. It would have been crisper if I had left it in the oven for another few minutes, but I was afraid of burning it. As it was, I would happily serve it to a crowd. *Dough can be made ahead and kept in the refrigerator for 2-3 days. Prepare pizza dough and let rise. While the dough is rising, make the buttermilk bechamel sauce. In a medium-size saucepan melt the butter over medium high heat. Add the flour and cook, stirring constantly, for a few minutes to cook out the rawness of the flour but not long enough for it to brown. Add the buttermilk, whisking constantly to keep it from lumping until it has been fully incorporated into the flour and butter paste. As soon as the mixture starts to bubble, lower the heat and cook, stirring frequently, until the mixture is thick enough to coat the back of the spoon. Remove from the heat and set aside. Move a rack to the bottom slot of the oven and preheat the oven to 450 deg. F. Sprinkle cornmeal around the bottom of a pizza dish. Using your hands, spread the dough around the dish, allowing for a slightly raised edge. Bake the naked crust for five minutes. Spread the bechamel over the dough, then the shredded Mozzarella cheese. 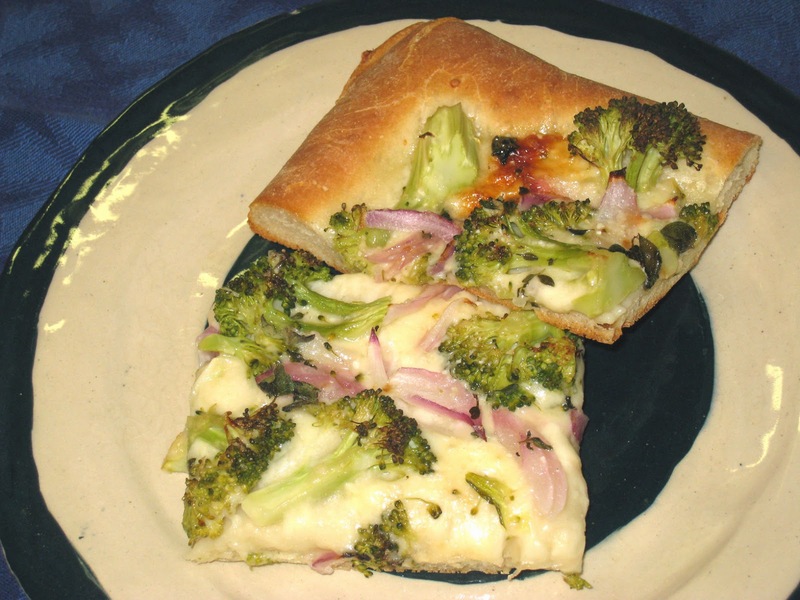 Season with salt and pepper to taste, then layer the broccoli and red onion over the cheese. Sprinkle the grated Parmigiano Regganio and fresh herbs over the top. Place the pizza on the bottom rack and cook 20 to 25 more minutes, until the cheese is bubbling and the crust is golden brown. i love the combo of onions and NO pizza sauce. thanks for this share!